Serina’s whole life has been focused on learning the skills she will need to become one of the wives of the heir to the throne. Her sister Naomi, less pretty and always in trouble for rebelling against the strict rules girls and women must follow, is expected to become Serina’s handmaiden at the palace. Two unexpected events result in the wrong sister being picked by the heir, while the other one is banished to an isolated and violent island prison. The sisters must now use their skills in a world neither one has been trained for, in the hopes of escaping and rescuing the other. I like reading trilogies, and two more books are planned in this series. That’s good news, considering the cliff-hanging ending of this first novel. With the recent television and film success of Margaret Atwood’s The Handmaid’s Tale and Suzanne Collins’ The Hunger Games trilogy, this book fits into popular dystopian worlds with the heroine learning she is stronger than she thinks. I also like the structure of the novel, the alternating chapters told first by one sister then the other. This meant either Serina or Naomi was on-site to witness and participate in each increasingly dramatic and dangerous catastrophe. 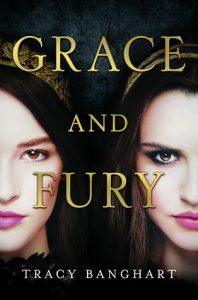 Tracy Banghart’s Grace and Fury is a page-turner of an adventure story, filled with both heroic and traitorous characters whose actions cause plot twists and story surprises at the end of every chapter. This novel has adventure, fantasy, fighting, sibling rivalry, romance, and girls stepping out of their expected comfort zones to battle prisoners, poisoners, and palace intrigue. It gets a 5/5. I loved her Mission Statement on her website, http://tracybanghart.com/tag/grace-and-fury: “Tracy Banghart’s novels feature strong women, realistic romances, and tight female friendships. She believes in cultivating worlds where women support rather than compete with one another, and first kisses happen en route to new adventures, instead of in lieu of them.” She has written several other YA series and stand-alone novels.